Come Sunday offers a cautionary tale about the abuses and theological confusion that can arise in charismatic cultures where ‘God told me’ is common parlance and amplified by the ‘personal relationship’ dynamics of individualistic evangelicalism. Come Sunday presents a sympathetic portrait of Pearson, valorizing him for following his convictions even if it cost him dearly. But to its credit, the film does not demonize the other side. Though certainly biased toward Pearson’s theology (its telling postscript declares: “His following is steadily growing.”), the film understands why most Christians cannot abide the doctrine Pearson preaches. 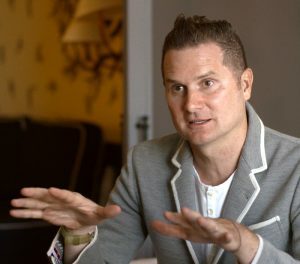 The same could not be said for The Heretic, the new documentary about Rob Bell’s journey from being a Michigan megachurch pastor to a surfing spiritual guru. Unsurprisingly given its title, The Heretic brandishes the label as a badge of honor, framing Bell as a rebel prophet and those who disavow him as stereotypically anti-gay, Trump-loving, bullhorn-brandishing fanatics. Voices of dissent are seen only in cable news soundbites, as in Franklin Graham calling Bell a false teacher and a heretic. We later see Graham singing Trump’s praises, advancing a connection the film really wants to make (that evangelicals who don’t like Bell must also love Trump). Unfortunately, The Heretic comes across more as an extended PR reel for Bell than a documentary that engages all sides of his story and truly considers the implications of his beliefs. The latter might have been interesting. The former is just boring. One of the sad things about these films is that both Pearson and Bell are talented communicators who had great potential. When I was doing research for Hipster Christianity and visited Bell’s Grand Rapids church in 2009, I saw firsthand how effective and engaging he could be rhetorically. You see it as well watching The Heretic, where some of what Bell says is clever and compelling (“The Bible holds the flag accountable. It has no interest in holding hands. It speaks truth to the flag.”). One of the problems with clever communicators who have big platforms and bestseller expectations, though, is that they must constantly push the envelope of cleverness to maintain their “relevance” and renegade edge. And this almost always leads to unorthodox places. The truth is, when “relevance” means reinventing the wheel or constantly “rethinking” major doctrines of historic Christianity, it just becomes gimmicky and sad. But this is where Bell now resides. Along with others whose “fresh” takes on Christianity (on sexual ethics, for example) come with the minor asterisk of wholly dispensing with two millennia of Christian wisdom, Bell is simply embodying the worst tendencies of ahistorical American evangelicalism and its notorious chronological snobbery. When ‘relevance’ means reinventing the wheel or constantly ‘rethinking’ major doctrines of historic Christianity, it just becomes gimmicky and sad. All of a sudden? As if Bell’s corrective on how we’ve read the Bible wrong will finally unleash its danger and beauty and provocative timeliness? And it’s not just a lack of historical perspective; it’s also a lack seeing beyond the Western, well-educated, middle-class version of Christianity that spends $7 on drip coffee and spends all day on Twitter. In The Heretic Bell says Christianity is “done” if churches are “not talking about our connection to the soil,” “don’t have a big, wide, open embrace of science,” and aren’t advocating for women’s issues and the LGBTQ community. The may be true of churches in L.A., Portland, and London, but what about the churches in Sub-Saharan Africa, China, and Latin America that may not be tackling Bell’s list of social causes but are nevertheless growing rapidly on the basis of boldly preaching the crucified and risen Christ? Are they “done”? Quite the contrary. Ultimately the gospel of “inclusion” and “solidarity” that Pearson and Bell preach is powerless to give true hope to people in their sin. It demands no repentance and has no consequences. These words may sound to the world like love, but they are anything but. But where in that gospel is the actual problem (sin) and the specific solution (Jesus Christ)? Where is the tension and resolution? Where is the conflict? It’s not there. Bell of all people—storyteller that he is—should know that stories with no tension, no conflict, and no stakes are bad stories. Bad, boring, hopeless, and sad. If the Gospel Isn’t Shaping Your Church, What Is?